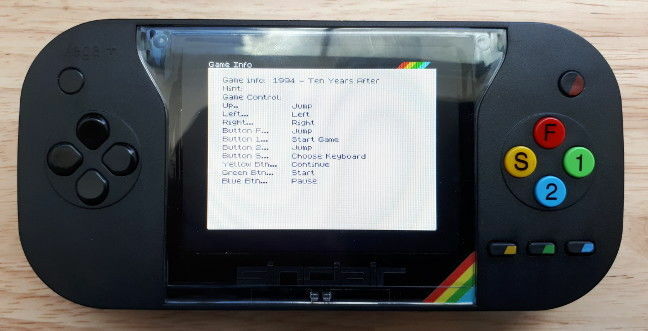 Review The ZX Spectrum Vega+ is running open-source Spectrum emulator software FUSE, The Register has confirmed while carrying out a hands-on review of the handheld console. As regular readers know, the Vega+ is the flagship product of Retro Computers Ltd, the company which took £513,000 in crowdfunded cash from members of the public to produce handheld ZX Spectrum-themed gaming consoles. It failed to deliver any for two years and then belatedly emitted what appear to be several dozen of the devices last week. With public interest at an all-time high in what the company has actually produced during the ongoing scandal, El Reg acquired one from an RCL customer for review purposes. No instructions were supplied with the console. In time-honoured retro gaming fashion, The Register’s crack review team resorted to button-mashing to figure out what did what. 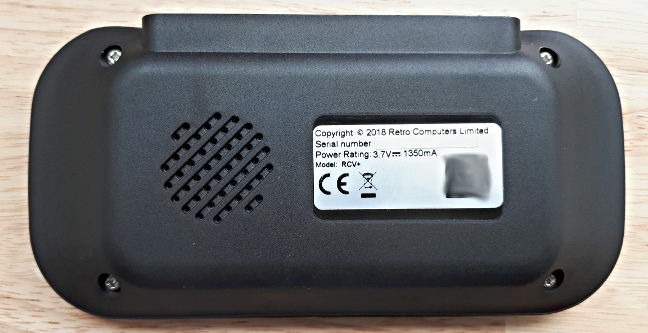 Supplied with 18 games, our review console (lent to us by an RCL customer who wishes to remain anonymous) was finished in black plastic with a very bright screen, on which we will say more later. 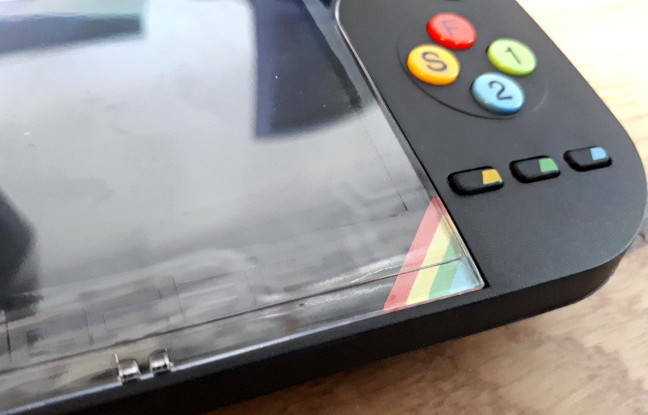 The plastic screen cover looks cheapish in our opinion, with the Spectrum rainbow branding being a small triangle of coloured paper that looks for all the world like it was run off on a home inkjet printer. There are two buttons set almost flush into the case above the D-pad and the coloured buttons. The left-hand one of these is the power button and also brings up the main menu while the device is running, with the D-pad being used to navigate around it. There are also three buttons below the main right-hand set. These appeared to have been painted to give them splodges of colour. The right-hand side buttons are moulded in coloured plastic with the lettering painted or printed on. Games are loaded and played through use of the D-pad buttons and the red F button, which doubles as the enter key for most things. Every game bundled with the device appears to have been written by one Jonathan Cauldwell. Given that Sky and a host of other rights-holders to ZX Spectrum games have withdrawn permission for RCL to use their games, it could be these are the only games that RCL could legally use. The D-pad buttons are atrocious. El Reg suspects they were set too deep into the case so not enough protrudes above it to make gameplay comfortable. We found it necessary to use a prodding device to access the two buttons, which appear to operate on release rather than depression. Using the D-pad is uncomfortable, with the low-set buttons being extraordinarily stiff to press; it really takes a toll on the left thumb. Resistance from the buttons is enough to make you stop playing it after quarter of an hour. Start-up time from cold was around six or seven seconds – not unreasonable. The screen goes from a Retro Computers splash screen to the home screen, a blank white page displaying “© 1982 Sinclair Research Ltd”. From here you need to press the top left button to bring up the menu. We didn’t want to risk leaving our review unit on charge for extended periods of time, bearing in mind some customers’ reports of bricking, so we don’t have an estimate of battery life. Our review unit was able to display the battery voltage but could not measure the life remaining or the charge on it. The unit appears to power off at random intervals if you leave it alone for long enough, which may or may not be a power saving function; ours powered on again afterwards with no apparent problems. While charging, the screen maintains maximum brightness. We could not tell if it charged while the unit was powered off. The first thing we noticed was that some of the games have not had their keys mapped to the Vega+’s controls. While the main menu has an option to “remap game keys”, this is not the state a finished product should be delivered in. That it was delivered in this state at all suggests that it was rushed out of the door to buy RCL’s management some breathing space in their ongoing corporate woes rather than with any regard for consumer experience. The top right button (pictured above with a splodge of red paint on it) brings up the Game Info menu. There is a field labelled “hint” where the game designer can insert tips, tricks or explanations of gameplay. On our review console only a couple of games had this filled in. Using the red F button, we found more than once that it tends to input through several menu levels with a single button push, so trying to open the game list resulted in instantly re-opening the last selected game several times. That aside, the menu worked OK. With better buttons this could have been a much better experience. Some of the games we tried seemed to work well. "Byte Me", while fully functional, was particularly hard to play because of the lack of tactile feedback from depressed buttons. Opening "Egghead 5" produced an edge-of-hearing high pitched buzz which prompted us to close it again immediately. Some other games, such as "Izzy Wizzy Versus The Mutants", were unplayable out of the box unless the keys were remapped. The key mapping option in the menu would only bring up a virtual on-screen keyboard, appearing to only allow the mapping of keys to a keyboard that doesn’t exist on the Vega+. You'd need to have an external keyboard that functions through a Micro USB port, something Vulture Central is sadly lacking, even assuming the console can handle external inputs through the charging port. 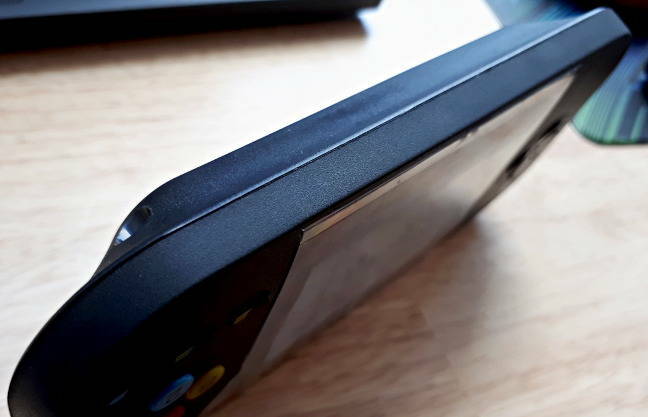 The Vega+ is uncomfortable to hold because of its rough edges. As is inevitable with injection moulding, the two clamshell halves of the case are not flush, leaving a sharp-to-the-palms edge that digs in. Some more bezelling work or a dust channel would have helped. One thing is plain; this is not a Rick Dickinson design. Rather, it’s what happens when you look at a picture of a Rick Dickinson case design and trace round it with crayons. On the bright(ness) side, the unit is very light – while we did not weigh it, it comes in lighter than most modern smartphones – and is only slightly larger than a smartphone in a case, so the Vega+ will fit into your pocket for on-the-go retro gaming. We also discovered that the screen on this unit has an unpleasant high frequency flicker if used at anything other than maximum brightness and contrast. In addition, the console occasionally freezes – a pleasant relief from the flicker. The micro SD card slot in the back of the Vega+ is unsprung. This means getting a card out of the unit needs a tool such as a pin. The headphone jack didn’t work on our review unit, either when plugged in during gameplay or when plugging them in with the unit off and then powering it on. 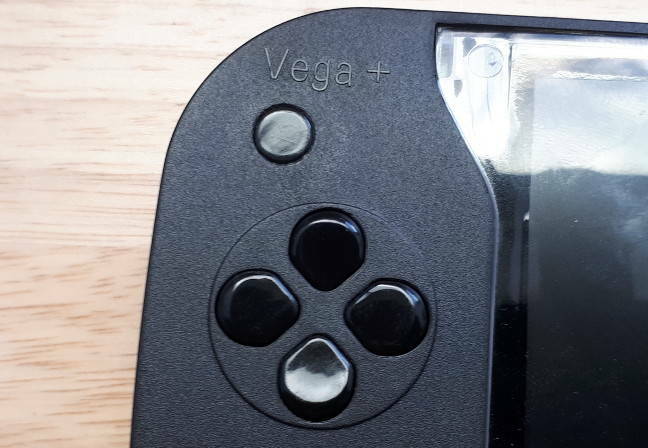 Much was made, at the outset of the Vega+ project, of it running custom firmware – something RCL, the console’s makers, had to abandon after a dispute over payment with Chris Smith, author of the original firmware intended for the Vega+. Since then rumour and speculation has abounded as to what it is running. The Register can confirm that the Vega+ is in fact running the Free Unix Spectrum Emulator (FUSE), version 1.3.0, as released on 3 October 2016. By saving a game to a micro SD card and then opening the .s03 file generated by the Vega+ in a text editor on a PC, we found plain text that confirmed the presence of FUSE. FUSE author Philip Kendall also examined the savegame file and he confirmed our findings. RCL itself had said it was using software that "incorporates" FUSE, in a post from late July on its Facebook page. FUSE is licensed under the GNU General Public Licence version 2, which tells those distributing software under that licence: "You must make sure that [customers], too, receive or can get the source code. And you must show them these terms so they know their rights." Neither the GPL nor the FUSE source code were referenced on RCL's website at the time of publication. The Vega+ is, in our view, not worth the £105 that RCL customers each paid for it. The buttons are borderline unusable, the case is uncomfortable to hold and the screen is either far too bright at a usable setting or flickers. Most pertinently, it does not include 1,000 games and it is not the console that RCL’s customers originally paid for in the first £513,000 crowdfunding exercise through Indiegogo. Why Sir Clive Sinclair’s corporate shareholder in RCL, Sinclair Research Ltd, has not intervened is a source of ongoing confusion. Robert Freestone, an SRL director, failed to respond to The Register’s previous enquiries about SRL’s decision not to dismiss the RCL management last week.